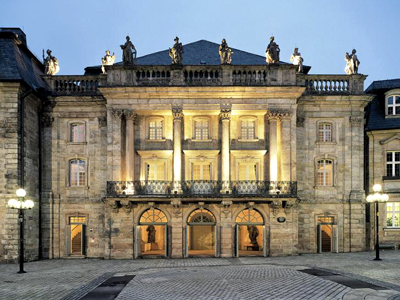 MUNICH — Bayreuth’s Rococo gem of a theater, the Markgräfliches Opernhaus, will reopen April 12 after a five-year, €32-million restoration. On the bill, fittingly: Hasse’s Artaserse (1730), as mounted by the Theater-Akademie August Everding. Like virtually every public project in Germany these days, the effort took longer than expected and went over budget. Little or no funding came as a result of the building’s 2012 inscription as a UNESCO World Heritage “property” just before work began, leaving Bavarian taxpayers to foot essentially the whole tab. Carlo Galli Bibiena created his sumptuous interior entirely in wood, with canvas, under the remote eye of his famous father Giuseppe. It sits within an urbane masonry shell by architect Joseph Saint-Pierre, all on orders from Wilhelmine of Prussia. The doors first opened in 1748 for stagings of Jommelli’s Ezio and the Hasse opera. Two years later, Saint-Pierre finished his façade. The restorers progressed meticulously, from the ceiling down through the loges. Their mantra: “as bright and colorful as [when new].” Stage and proscenium have been remade in their 18th-century form, reversing Nazi-era structural changes. 4,500 bricks have been replaced. Michael Hofstetter will conduct Artaserse, which transfers in May to the Theater-Akademie’s home here. Next Thursday’s premiere and attendant festivities will video-stream starting at 12:30 p.m. EDT at www.br.de [slash] franken. A tight-squeeze matinee concert May 1 by the Berlin Philharmonic, paying tribute to the Wagner town with the Wesendonck-Lieder, plus Beethoven, will likewise show online: 5 a.m. EDT at www.br-klassik.de [slash] concert. This entry was posted on Wednesday, April 4th, 2018 at 3:33 pm	and is filed under Munich Times. You can follow any responses to this entry through the RSS 2.0 feed. Both comments and pings are currently closed.